When wisdom teeth come in, they can cause numerous oral health issues, ranging from periodontal disease to overcrowded teeth. The expert team at Dental365 offers wisdom tooth removal at their New York, NY and surrounding area practices to help you avoid problems before they occur. If you are experiencing painful symptoms, or you have questions about removing your wisdom teeth, reach out to us today to set up an appointment. Wisdom teeth get their name from their delayed growth. Rather than emerging with the rest of your teeth in early childhood, this third set of molars typically does not come in until you are in your mid- to late-adolescence. Why is wisdom teeth removal necessary? In some cases, the wisdom teeth may fail to erupt or become impacted. This can damage surrounding teeth and bone tissue. Cysts can often develop around the impacted tooth, causing further complications and making impacted wisdom teeth removal necessary. If a wisdom tooth only partially erupts, a flap of tissue usually grows over it. This flap can trap food, bacteria, and other contaminants, which may lead to periodontal disease. If your jaw cannot accommodate a third set of molars, wisdom teeth can force other teeth out of alignment, resulting in many other oral health issues. While it is possible for wisdom teeth to erupt without issue, this is rare enough that we may recommend that you have them removed as a preventative measure. 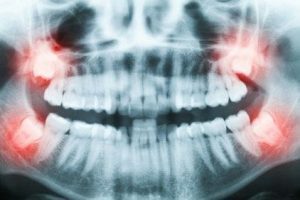 What does wisdom tooth extraction involve? Due to the extensive nature of wisdom teeth surgery, we will typically administer an anesthetic to ensure your comfort. You may only need a local anesthetic, but more complex procedures typically require heavier sedation. Once the anesthetic is administered, we will open the gum tissue over your wisdom tooth. If bone is blocking access to the tooth root, it will be removed so that we can separate the root from the jawbone. We sometimes separate the wisdom tooth into sections to make it easier to remove. Once the tooth and tissue have been completely removed, the treatment site will be thoroughly cleaned to ensure no debris remains. We then suture the surgical site closed and place a cotton gauze pad to control bleeding. What can I expect after wisdom tooth removal? Much of your aftercare will involve taking care of the treatment site. You will need to replace the gauze regularly. Strenuous activity or even lying flat can prolong bleeding, so it is recommended that you prop your head up with pillows when you rest. If the treatment site bleeds for more than 24 hours, you should contact us immediately. During recovery, you must be careful to avoid developing what is known as dry sockets, or the loss of blood clots at the treatment sites. You will receive specific instructions for preventing dry sockets, including eating only soft foods and avoiding use of a straw when drinking beverages. Pain management plays an important role in recovery, as well. Over-the-counter or prescription pain medication can help minimize discomfort. We will outline specific instructions on how to manage your pain. Swelling and bruising will typically last for several days after the surgery, but ice packs can help decrease this inflammation. Both side effects usually go away within several days, though bruising may last a little longer. At Dental365, we are committed to providing our patients with high-quality dental care. To find out more about wisdom teeth removal and what is involved, contact us today. Call us today at 844.365.DENTAL or request an appointment through our website at any time.